Clive J. Anderson, an Irish native from Co Cork and the new owner of Pelham Funeral Home, has been a funeral director and embalmer for over fifteen years. His calling came at the age of fifteen when he buried his own father. For Clive, funeral service is not a “job,” but merely a calling to serve others in their time of need. Clive was born and raised in Ireland. The eldest of four, he grew up on a farm where his intense work ethic was instilled at an early age, and farm life provided daily exposure to the cycle of life. Shortly before his twelfth birthday, his dad was diagnosed with cancer. The loss of his father had a profound affect propelling him into a lifelong career as a funeral director and embalmer. Unfortunately Clive’s story is not an uncommon one, but he says the experience drives him to give comfort and serve families in their time of need. Clive began his career at the prominent Jerh O’ Connor & Sons Funeral Home in Co. Cork before immigrating to the United States and spending many years as a funeral service consultant for Matthews International. On February 7, 2014, his dream came to pass when he purchased the Pelham Funeral Home from the children of its founder, James Flood, who opened the Pelham institution in 1946. The recipient of several awards, Clive was recently recognized by the Irish Echo “40 under 40” for his contributions to the Irish community and was also an aide to the Grand-Marshal of the Irish Business Organization on St Patrick’s Day. Clive earned a degree from the New England Institute of Funeral Service in 2004. In addition to his role as proprietor, he currently sits on many boards and is a member of the New York Athletic Club. Clive resides in Pelham and in Woodlawn. July 15, 1935 marked the day E. James Flood received his state licenses as an embalmer and funeral director after graduating from the New York School of Embalming and Restorative Art, NYC. In 1946 Mr. Flood founded Pelham Funeral Home with his partner Nunzio Albero after purchasing and converting a home into the new business. 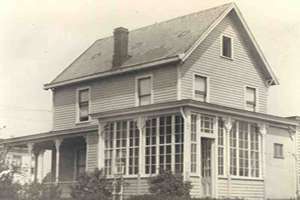 In 1971, Pelham Funeral Home, Inc. expanded to include a modern show room where families can choose a casket and other items for their loved ones who have passed. Mr. Flood was the longest licensed undertaker and embalmer in New York state and was considered to be a legend in his profession until his passing in 2002. Over the years, he also formed a Trade Service with more than 25 funeral home accounts performing removals, embalming, restorative art, cosmetology, arrangements, and directing. The service included two full time embalmers, fully equipped removal cars, and CB radios. Mr. Flood also expanded this service to out-of-state funeral homes in Connecticut and Massachusetts. Mr. Flood also co-founded the Westchester Funeral Directors Association. Clive's lifelong dream of owning a funeral home came to fruition in February of 2014. Read the Funeral Business Advisor featured article about Clive Anderson's success story. Aisling Irish Community Center to Honor Clive Anderson of Pelham Funeral Home on September 29 at Dinner Dance Gala!